Susanne Schštz is hard at work on breaking the cat code. She is a professor at Lund University in Sweden, where a long-standing research program is proving that cats do actually use vocal communication—with each other and with their human caretakers. Understanding the vocal strategies used in human-cat communication will have profound implications for how we communicate with our pets and has the potential to improve the relationship between animals and humans within several fields, including animal therapy, veterinary medicine, and animal sheltering. 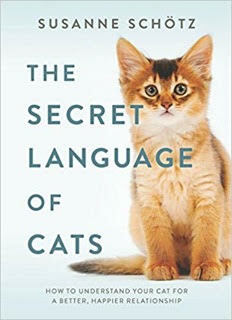 In The Secret Language of Cats, Schštz offers a crash course in the phonetic study of cat sounds. She introduces us to the full range of feline vocalizations and explains what they can mean in different situations, and she gives practical tips to help us understand our cats better. I have a long-standing mystery in my house, and that mystery's name is Alice. Alice is, of course, our feline family member who came to live with us 5 years ago and has been mystifying us ever since. I've had cats my entire life and considered myself pretty knowledgeable about kitties, but Alice has stumped me. I simply cannot figure out what is going on with her. Enter Susanne Schotz. I had actually heard of Dr. Schotz through a viral video where she explained her linguistic theory for cats. When I found out about this book, I thought I had found the key to understanding Alice. The first thing I realized about this book is that it was not one that I would sit down and read through, cover to cover. This is much more of a reference book, the sort of work where you look up the information that you need, as you need it. Fortunately, the book is well-organized and I was able to find what I was looking for. While this book concerns itself mostly with the sounds that cats make, Schotz does include body language, which I found very helpful. She also has practical tips that give concrete suggestions about how to handle certain behavioral issues. My one complaint, or perhaps it is more of a caution, about this book is that it goes deep into the study of linguistics. Honestly, a lot of it was just too far over my head for me to follow. However, if you really wanted to know more about that, Schotz does give a lot of examples and has an extensive appendix to help. There are a couple of issues Schotz addresses, namely inappropriate elimination (or peeing everywhere!) and not getting along with other cats, that don't apply to Alice, but I think would be very useful for a human who is dealing with one or the other with their cats. So, how did this work? I'll be honest, Alice is still a mystery. Much of what I read only supported what I had already suspected--that Alice just doesn't like many people, except when she does and then you'd be prepared to accept her affection, or else! That being said, though, I at least knew that my theories about her weren't crazy.